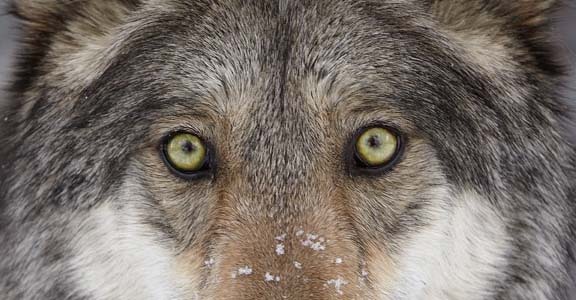 Back in February I commented on a BBC programme about the ecological system of Yellowstone National Park, and how it had benefited after the re-introduction of wolves. I concluded firstly that the beautiful balance of such systems poses yet another layer of complexity and teleology for evolution to explain, and secondly that for TEs to pick and choose which bits of nature God governs is untenable. 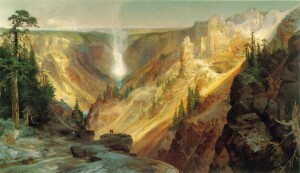 Well, recently I saw another film about Yellowstone with some more fascinating lessons. This one was about the establishment of the park, and the very different ideas of “nature” that had governed its role in American life since. I’ll do a whistle-stop tour. So, to leave the comfort of civilised landscapes was to venture not into majestic, but horrific, regions occupied by wild – in the sense of near-demonic – creatures. That understanding puts the colonisation of the wild west in a more heroic light – but also explains the frenetic destruction of bison or passenger-pigeons and the early photos of Yellowstone piled high with animal corpses. Fear and hatred are close companions. The key to the new development is not the denial of the fearfulness of nature, but its transformation into a good – the primal terror of being alone in the wilderness is an experience of God, perhaps – or more properly, of “Nature” as a god. It may be dangerous, but it’s real. You’ll see though, from the Moran painting, that integral to the Romantic ideal was the emptiness of the wild. It’s the mountains and the valleys that induce sublime feelings. The animals are just a nuisance, and any people in the landscape are destructive of its beauty, unless there only to provide an aesthetic sense of scale. And so it was that not only did hunting continue unabated as “real men” proved their indomitable defiance of nature, but the native Americans who has occupied Yellowstone for millennia were evicted. They spoiled the whole thing. Time, and fashions, changed and a more humane spirit began to prevail. The animals at Yellowstone began to be seen as part of the attraction. At least, some of the animals – the herbivores – perhaps seen as sharing the “original disposition” Wesley saw in domesticated creatures. Even by the scientists and rangers “conserving” the park, predators were seen as “bad” animals, and humans were needed to right nature’s wrong by shooting them – especially top predators like the wolf, which were eradicated early last century. It took a good while to realise that the good animals were becoming too numerous, requiring even more shooting, now of the herbivores too – not this time for sport, but for conservation. Since then, as I described in my February post, wolves have been re-introduced, prey-species naturally controlled and the health and diversity of the environment, so long mismanaged by modern educated men helping nature along, greatly restored. We could justly substitute, for Aldo Leopold’s ancient and sapient mountain, the ancient and sapient God who made it. Yet many people have not caught up with the beauty and wisdom of the systems of mutual interaction in the natural world. But there are many scientists – even Christian ones – not to mention sophisticated theologians, who will attribute the wolf (and the internal parasite, ecologically often seen now as a top-level predator) to some malevolent, or at least blind and ignorant, force rather than to the sovereign God. The devil is still getting plenty of credit for the bulk of wild creation from all sides, evolutionists no less that Creationists. I should add one more stage in Yellowstone’s history – one that is currently wrongfooting even the green ecologists. And that is that some people are coming to acknowledge that the beauties of Yellowstone were never the result purely of “nature”, even aided by the wolf and lion. The landscape was, in fact, largely the product of those native tribes evicted by wise white conservators of the sublime, and it has suffered as much from their absence as from that of the wolf. The sagacity of the generic “Red Indian” has been over-romanticized, too. His supposed spiritual wisdom has become a bit of a repository for the self-indulgence of civilisation’s guilt trips (the “Dances with Bikers” scene in Hot Shots was a good antidote to this!). Yet it is notable that native Americans did not create a natural paradise by careful research projects and ideological updates every few decades, but just by living their lives in the place in some kind of respectful way. There are still too many intelligent people who see humans as a parasite on the face of the world. But the Christian view has always understood that, as God planned things, human beings ought to enhance the world, adding value rather than destroying. But one might ask why brute beasts inflict injury on one another, for there is no sin in them for which this could be a punishment, and they cannot acquire any virtue by such a trial. The answer, of course, is that one animal is the nourishment of another. To wish that it were otherwise would not be reasonable. For all creatures, as long as they exist, have their own measure, number, and order. Rightly considered, they are all praiseworthy, and all the changes that occur in them, even when one passes into another, are governed by a hidden plan that rules the beauty of the world and regulates each according to its kind. Although this truth may be hidden from the foolish, it is dimly grasped by the good and is as clear as day to the perfect. Indeed, this struggle for life that goes on in the lower order of creation does but admonish man for his own welfare to see how resolutely he must struggle for that spiritual and everlasting life by which he excels all brute beasts. Thanks, Jon –this was a good read. Jared Diamond in his book “Collapse” shares many pre-industrial examples of peoples who mined their surrounding environment to the point of contributing to (or even probably causing) the collapse of their own local civilization or tribe. And his examples include some from pre-Columbian native America. So it is worth remembering that white westerners don’t hold a monopoly on shortsighted ecological exploitation. But we do seem to have developed the technologies to amplify the effects of our bad habits to a likely unprecedented scale. Yes, you’re right, of course. I remember buying a book on Aboriginal culture when visiting my daughter in Australia. I was surprised just how wanton some of their use of fire was, one anthropologist noting an occasion when several square miles of forest were burned in hunting, with a haul of a couple of racooons. And it’s also the case that the imposing limestone hills of Greece are largely the result of deforestation for shipbuilding in the classical era. Then there’s the Sahara, but opinion seems divided on that. All that really simply underlines that when people respect their environment, they can improve it – but we still live under sin’s rule. This brought to mind the Old Testament commands to let the land lie fallow every seventh year, or to dismantle entrenched “debtorhood” in the jubilee. While its true that the Hebrews never really practiced all of this, the lessons are still driven home on the spiritual/ecological erosion we all suffer from today as we feel driven to disregard even a Sabbath rest for ourselves. Yes, “Jubilee” has become (or at least was, for a while) a whole movement within Christianity regarding social justice, which is not far removed from “ecological justice”. One academic writer who’s great on demonstrating the fundamental wisdom of the torah in both these ways is Chris J H Wright (who was local enough to my old church to come and preach from time to time). Recommended: Old Testament Ethics for the People of God.